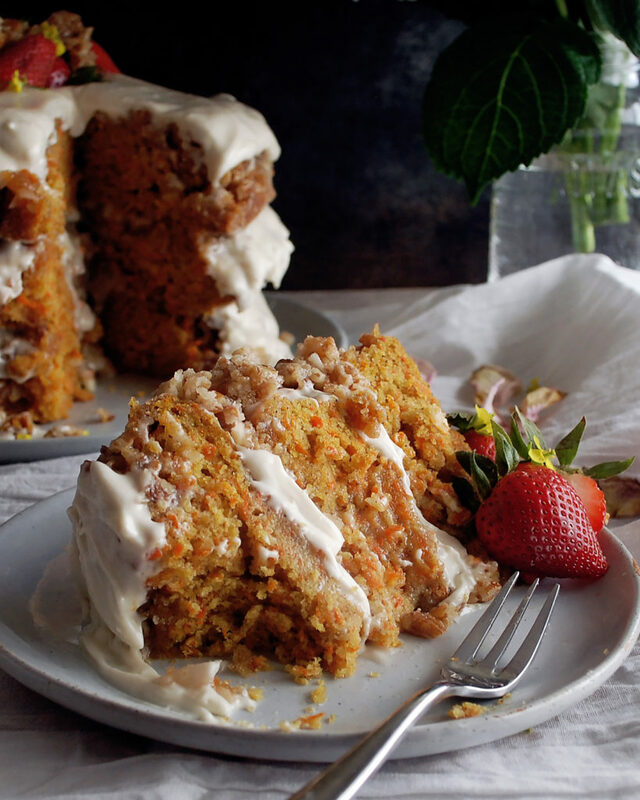 You can’t have Easter without carrot cake, and this is the ultimate carrot cake recipe. 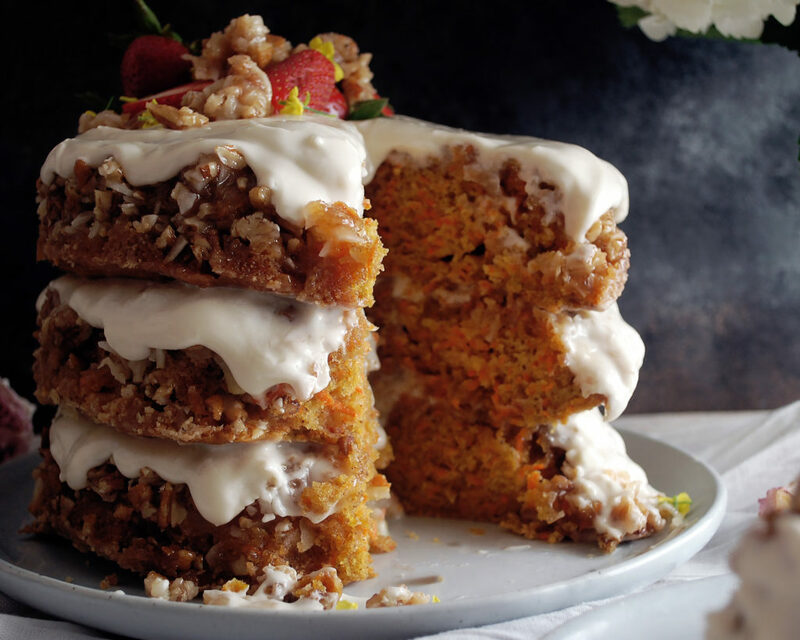 Let me just say that this is not your average carrot cake. 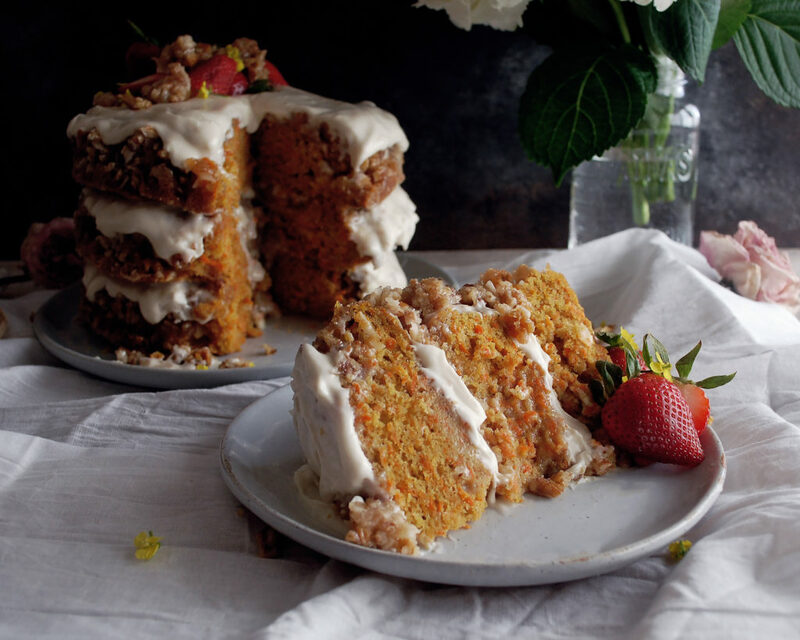 And it’s definitely not something to make if you want a simple piece of cake for the morning with a cup of tea. 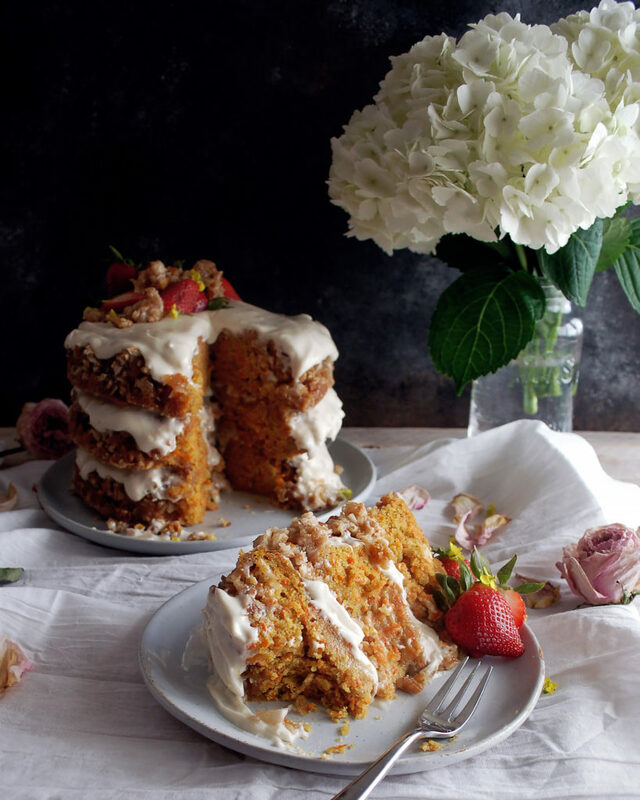 This is a show stopping, three-tiered, coconut carrot cake with sticky coconut pecan praline layers and a silky, smooth coconut cream cheese frosting. It is insanely delicious. A couple days ago I posted these Deviled Egg Gravlax Tartines, which are perfect for brunch, but of course I needed to make something sweet for dessert as well. I mean, who wouldn’t want to end a holiday with a big slice of THIS. The batter itself is extremely tender and moist. 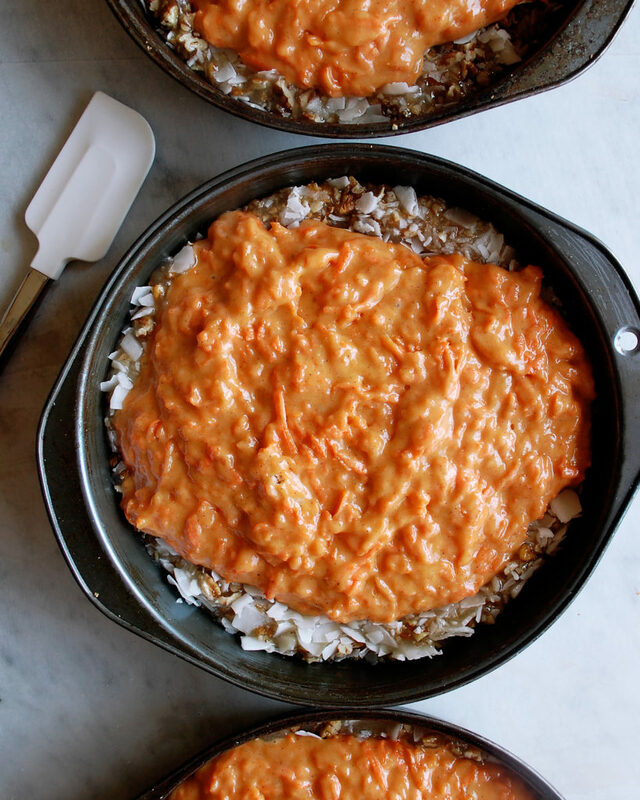 I use freshly grated carrots for a beautiful bright orange color and melted coconut oil for an irresistible texture. The absolute best part about this, though, has got to be the praline layer. In a saucepan, you simply heat butter, whole milk, and sugar together until bubbling. This mixture goes straight into the bottom of the cake pans. 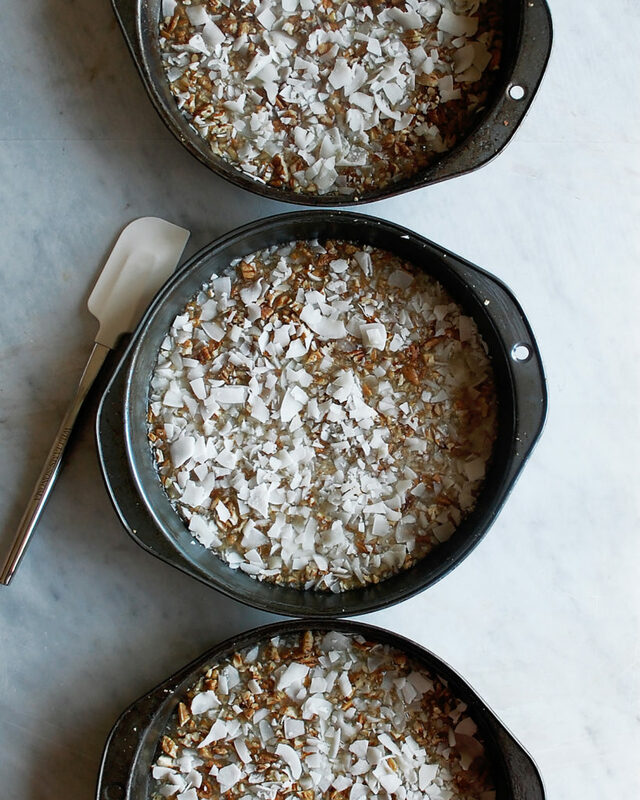 I sprinkle toasted pecans and coconut chips over top. And the carrot cake batter gets poured right in. 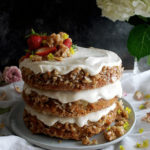 So…as the cakes bake, that praline layer caramelizes and the butter almost “fries” the cake in a sticky, sweet, crunchy mixture. When these things come out of the oven, they’re bubbling and smelling crazy good. After about 10 minutes out of the oven, I run a butter knife along the edges and invert the cakes by flipping them onto a cutting board. 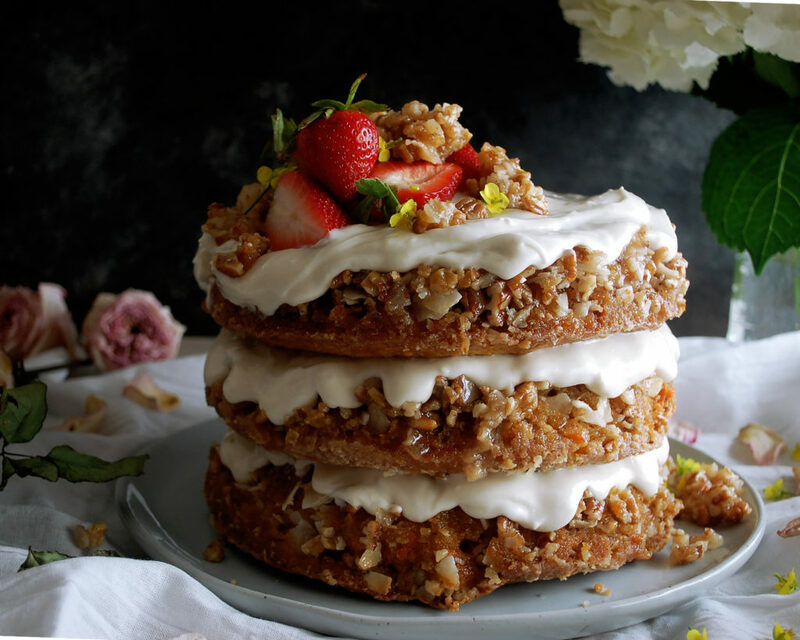 The praline layer ends up on top, and it’s honestly hard to resist cutting into one right then and there. But, the patience will be well worth it. You should let the cakes cool completely before frosting them (I rushed it a little bit so the frosting melted in the center of my cake, but it tasted so good I didn’t even care). The frosting is a simple cream cheese frosting, but I add some coconut milk as well. I get the organic coconut milk from Whole Foods because I find that most brands have a lot of preservatives and weird looking ingredients in them. I like to only cook with products that have few, whole ingredients. Anyways, so you’ll want to use the thick, top part of the coconut milk. Gently spoon the thick milk out, and leave the watery milk behind…it will make the frosting too thin. The key to this frosting is to chill it before using. I like to start the frosting as soon as I flip the cakes out of the pans. I’ll put it in the refrigerator while the cakes finish cooling, and by the time the cakes are ready, so is the frosting. Assembling the cake is easy. The layers might be intimidating, but it’s as simple as frosting each layer individually, stacking one layer on top of the other, and trying not to let any layer slide off in the process. These layers are extremely dense, which means super heavy. This means the layer of cake will push the frosting to the sides. I try to frost heavier in the center and leave the edges somewhat empty so the frosting has room to move. That way, the frosting won’t be dripping off the sides all that much so you can see the beautiful layers (a little dripping is ok because after all, the frosting is usually everyone’s favorite part). And that is it! 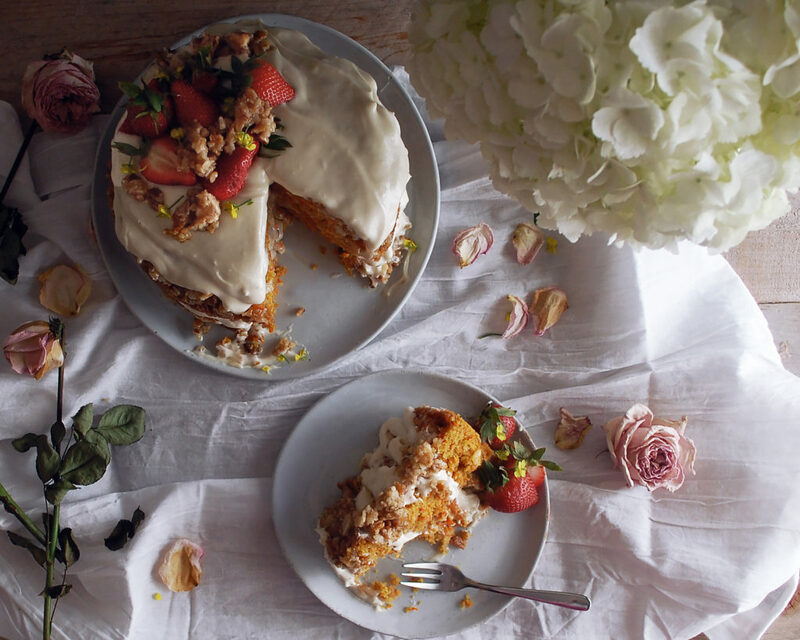 The absolute best, most indulgent carrot cake. I top it off with some fresh strawberries and a little bit of the praline that got stuck on the pans as the cakes baked (turned out to be the perfect garnish). Definitely try this for Easter…everyone will be so impressed and absolutely love it. Enjoy! Preheat the oven to 350F. In a mixing bowl, whisk together the flour, baking powder, baking soda, and spices until fully incorporated. Fold the grated carrots into the dry mixture until all pieces are coated. Using a stand mixer with the whisk attachment, beat together the eggs and 15 ounces of sugar until smooth. Drizzle in both types of oil. Mix to combine. Pour the wet mixture into the dry and stir until everything is incorporated (make sure there are no clumps of flour left). Set the batter aside. In a small saucepan, combine the butter, whole milk, and remaining 15 ounces of sugar over medium heat. Let the butter melt and the mixture come to a boil. Whisk so that you get a smooth, thick mixture. Evenly distribute the praline mixture into 3, 8” greased cake pans. Do the same for the pecans and coconut flakes, making sure the praline mixture is completely covered. Pour the batter into the cake pans, filling each one up to the top. Bake for about 40 minutes before checking the cakes. Insert a toothpick to make sure the cake is done (the toothpick should come out clean). Let the cakes cool in the pans for 10 minutes. Run a butter knife along the edges of each pan to ensure the cakes come out cleanly. Starting with one of the cakes, place a cutting board on top of the pan (make sure the cutting board covers the entire pan with a little wiggle room). Hold the cutting board tightly to the pan and flip the pan over so that the cake comes out onto the cutting board, praline side up. Repeat with all the pans. Let the cakes completely cool on a wire rack. If there is any praline topping left in the pans, spoon it out and let it cool on a plate. Reserve for garnish. While the cakes cool, combine the cream cheese, butter, and coconut cream in a stand mixer. Using a paddle attachment, mix until smooth, scraping down the sides as you go. Add the sifted powdered sugar in 3 batches, gradually mixing it in. Lastly, add the vanilla. Chill the frosting for at least 20 minutes, or at least until the cakes finish cooling. 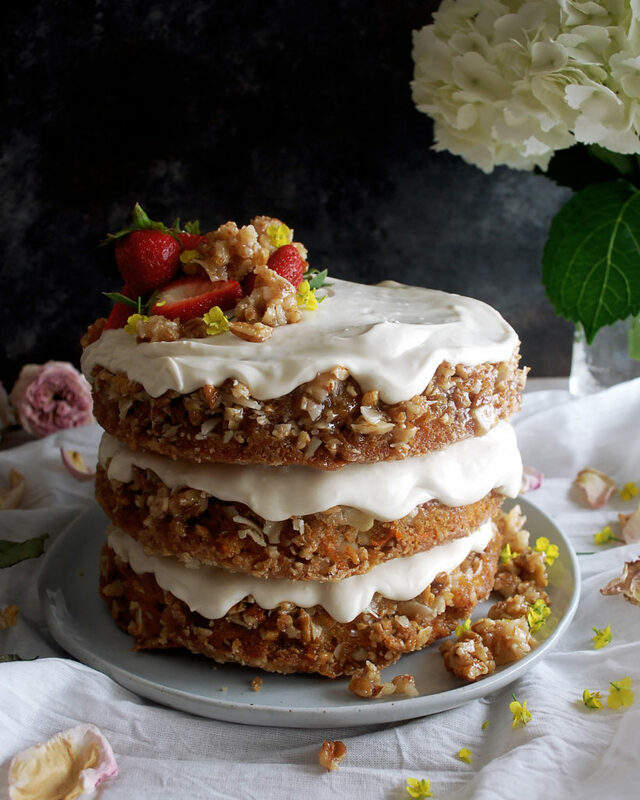 Frost each cake individually using a spatula and a generous amount of cream cheese frosting. I like to leave some space around the edges so the frosting does not completely drip down the sides. Carefully place one layer on top of the other. 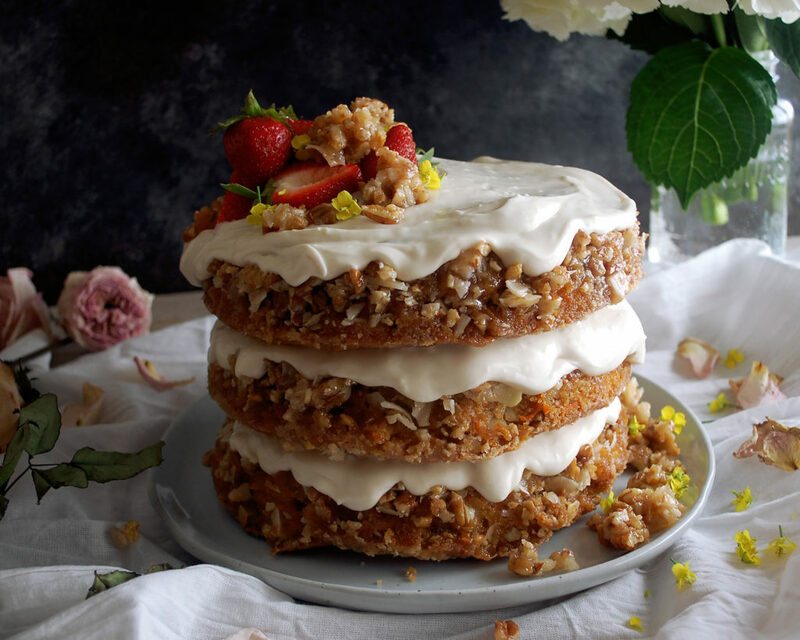 Garnish with fresh strawberries and any extra praline topping. Slice the cake very carefully. Serve chilled or at room temperature. You can also heat up the individual slices in the microwave. SAVE ME A PIECE OF THIS ONE????????????????????????? It says 15 oz sugar and 2 cups sugar. Which amount goes in which? one is for the butter mixture and the other to beat with the eggs. Thanks for pointing this out. I just updated the recipe to make it a bit clearer and have the units the same. So, you’ll beat 15 ounces of sugar with the eggs, and you’ll have another 15 ounces of sugar for the butter mixture. I’ll typically always write my ingredient lists in the order in which they’re used in the recipe. Let me know if this helps!! Can this be done in a 9x 11 pan? I’ve never tried it, but I’m thinking it would work! It might be harder to flip…so the praline would be at the bottom (but still would taste delicious). You probably will have to adjust the cooking time a bit as well. Let me know if you give it a try! This looks so yummy!! But do you lind the cake pans or prep them in any special way ??? It’s such a good one!! And I’ll just grease them with a little butter. Thanks for catching that – just updated the recipe!